When I received the PeachSkinSheets, one of the first things I noticed is how nice the packaging is. They were wrapped up in a pretty orange paper and a cute little peach hangtag. Simply perfect for a Wedding, Christmas or Birthday gift! Then after washing (cold or warm, no hot water) and drying them (on medium heat for 20 minutes to prevent any pilling) I noticed how the wrinkles really do come out of this set. I have many sheets where the flat sheet still has the original packaging crease in them. The 18 inches Deep Pockets made the bed easy to make up. I have wrestled in the past with placing a fitted sheet on my mattress and covering the entire thing and then waking in the middle of the night to the corner popping off. These PeachSkinSheets will not shrink and that is a very important to me. 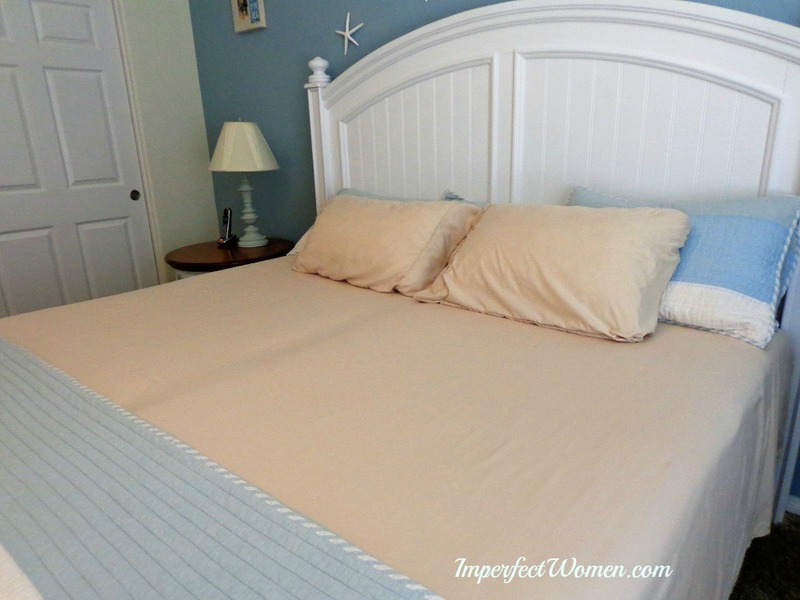 Shopping for Split King Sheets had become a full time job since we purchased our Memory Foam Adjustable Bed a year ago. We have tried other microfiber sheets but the finish is much softer on these and much more important than that, no pilling with PeachSkinSheets. My feet (callouses and rough skin) do not seem to snag on these either. We are finding with a memory foam mattress that these PeachSkinSheets with the Thermal control and Moisture Wicking Properties is a necessity. The sheets feel cool to touch and are breathable so both my husband and I (who are hot sleepers) are more comfortable at night. 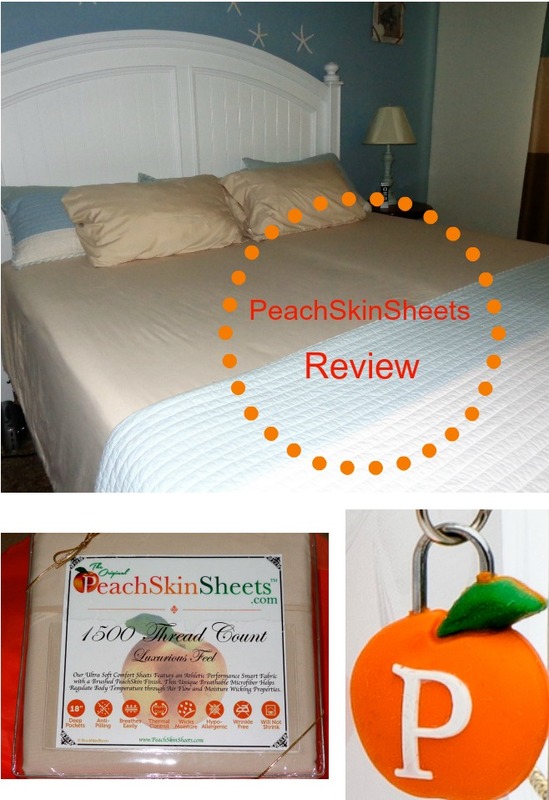 Check out this great at-a-glance benefits guide to find out even more reasons why PeachSkinSheets will keep you comfy at night. I am so happy to have finally found a set of quality sheets that are reasonably priced. I am sure I will be giving a set or two of these for gifts as they are available in all sizes and many beautiful colors. PeachSkinSheets have specials each month making the price even more affordable. 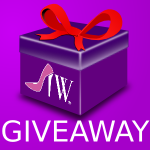 Prices start at $55 and they have 2 Colors of the Month priced at $55 for any size set. Their regular sale price is $69.95 for any size set while Split King/Adjustable Bed specialty sizes are $85. I may even give myself a full size Chocolate set and queen size Mint Julep set just so my guests can sleep with the luxurious feel of 1500 Thread Count when they are visiting! The Salt Lick BBQ - Best in Texas! This looks like a great brand of sheets for a great price. I would love to get a set of the eggplant and graphite gray. Definitely, will have to check at some of the local stores if i can find one similar to these sheets. We are looking to upgrade to a King size bed. We will be needing some new bedding. I will check this out. Looks perfect! 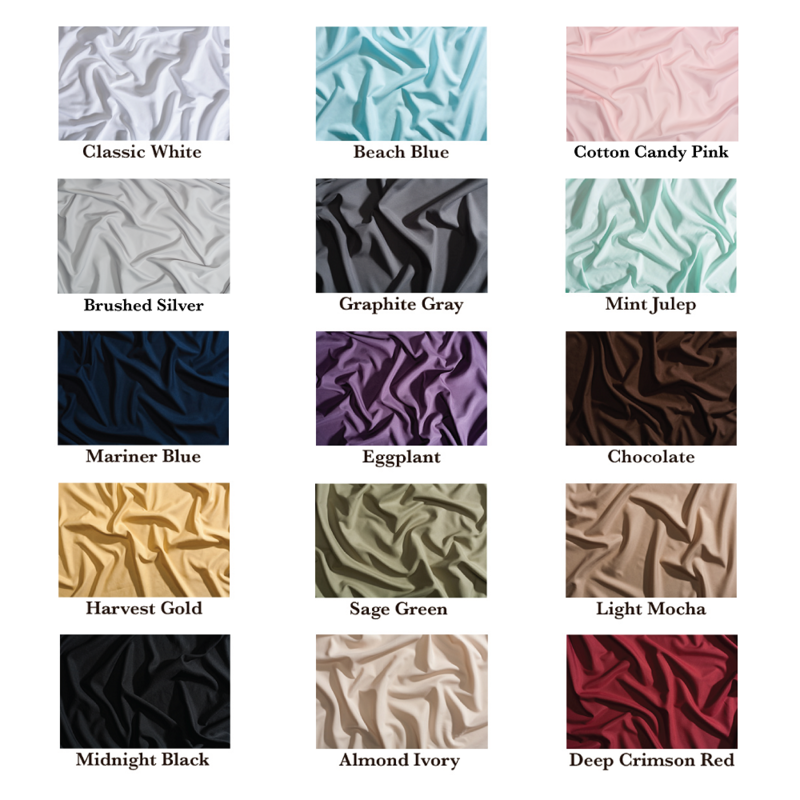 These sheets sound amazing and I love that they have an easy way to pick out colors. It’s great that these have been so soft. Always looking for new sheets. What a great place. I will try themf or sure! I love that these sheets feel cool to the touch. I hate sleeping with lots of blankets and in a hot and stuffy bed. That’s what I’m thinking! I like to feel refreshed while sleeping, and great sheets matter! I agree with you, the colors are so vibrant and pretty. They are perfect for matching up with any decor. Ohhhh these sheets sound lovely! I need new ones, so I’ll have to look these up. Great colors too. I am looking for some new sheets for our beds. I will have to check these out. I love the colors they come in. I do have to admit I am intensely curious about these sheets. I see them online all of the time! These sound like amazing sheets!! I know a good set of sheets can make a huge difference in your quality of sleep! We are mattress shopping. I’ve decided I am buying me some quality sheets when we decide on a mattress. I am tried of sleeping in less than quality perfections. The pink ones look so pretty. 1500 thread count sounds like a lot though. Are they appropriate for very warm climates? I will have to try them especially if they keep you cool. I always get hot at night! I’m a very hot sleeper. Microfiber sheets are normally hot. I hope they truly keep you cool! I love the pink and mint ones. Wow gorgeous and affordable I like this. I am also loving this color you chose. So pretty and the sheets look so smooth and comfy. They look lovely and I love the brand name. I think the sage green look perfect for my bed. Thanks for the recommendation. I definitely want to try a pair of these. These look so amazing! We are just moving, so we are getting all new bedroom things. I’ll have to show these to my fiancé. What an appealing name too! I think I’d want mine to be peach colored, although the deep crimson red would match our bedroom. We are in need of new sheets, actually. Wow, these sound like great sheets. I love that you can get swatches to see before you buy. I may have to do that. Love the color choices and the value. I need new sheets os perfect timing for this post! I heard these are awesome! Had the pleasure of feeling of the awesome sample they sent and they are so incredibly soft! These sheets sound like they would be sooo soft and cozy! I like the colors available. They are super soft. I have swatches, but haven’t ordered a set yet. Wow I love the array of colors! Sheets that can be used in all the rooms in my house! I need to replace my sheets. These are the sheets I will be getting. They are so nice, I love the samples they sent. So comfortable and I love this. So comfortable and I love this for my home. I would love to try out these sheets. I have bamboo sheets that I love. These look nice and soft. The material is so soft. I’d love to have a set or three of these sheets. I really like the colors too. These peach skin sheets are so comfortable looking and the colors are brilliant. It is hard to choose one color. Sounds amazing! Beautiful colors! Will need to check them out! Thank you! These sound like amazing sheets! I love all the colors! The sheets look really nice! Beautiful colors! Will need to check them out. I really like the sage, ivory and gray colors. Gray is kind of dark for a small bedroom, but I like it. Got some samples and wow are they soft! I got the samples today! Wow! I love them! I already have 2 sets of these sheets. I am a hot sleeper & not only are they cool & comfortable they also fit our Tempurpedic adjustable bed without coming off. Will be buying more to replace all my sheets! These seem like really nice sheets. I like that they keep you cool because I am a hot sleeper too. I have never tried these sheets before. They look like very nice ones. Those sheets come in so many different pretty colors! I like Midnight Black, Eggplant, and Harvest Gold. Would love to try those sheets.